Guest Post by Alex. Alex writes about android tablets for the last 2 years and had hands on experience with every tablet available in the market. During the past few days, the tablet community had been crazy about the release of Motorolaâ€™s Xoom (Android 3.0 tablet) and Appleâ€™s iPad2. Both seem to have emerged among the highly-anticipated tablets to hit the market and a lot of people are comparing the two tablets to determine which is best. Apple is the market leader with IPad and with the release of IPad2 they want to continue being on the first place while Google with the release of Android 3.0 they are hoping to challenge Apple as they did with smartphones a couple of years ago. Itâ€™s easier to catch attention when you look so stunning. This is not only true for people but also with gadgets.Â Thatâ€™s how the iPad 2 was created. It features a flatter and oblique back case in a beautiful white color and a round front border with just 8.8 mm thickness. If you think the iPhone 4 is thin, this one is thinner with a 9.7-inch screen. Indeed, the iPad 2 is an eye-catching gadget. Motorola Xoom has also something to say with regards to looks. This gadget is equally skinny at 12.7 mm. Unlike the iPad 2, the Xoom has no physical navigation buttons making the screen lightly bigger at 10.1 inches. Both indeed feature a stunning appearance but it seems that the iPad 2 got what it takes to win this round. 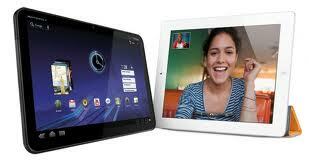 Both tablets feature a dual-core processor, the iPad 2 having 1 GHz Apple A5 and the Xoom having 1 GHz NVIDIA Tegra 2. We canâ€™t yet determine which is faster since there are no solid benchmarks that show a clear win of one over the other. But if we add the Random Access Memory (RAM) info of each, it seems that the Xoom has an edge with its 1GB RAM which is twice as much as the 512MB RAM of Appleâ€™s iPad 2. The Xoom sports a 2 megapixel front-facing camera and a 5 megapixel rear-facing camera with an Auto-focus and dual-Led flash features. On the other hand, Apple has not fully revealed the camera features of its new tablet except the fact that it can shoot a 720 / 30 p video though according to some rumours, the front-facing camera of the iPad 2 will only feature a VGA lens while its rear camera will only support a 1.3 MP lens. If these will be true, the Xoom obviously takes this round. In order to increase bandwidth, expedite growth, and support various applications, the International Telecommunications Union or ITU came up with the 3rd generation or more commonly known as 3G of the mobile telephony standards. This led to the improvement of many gadgets to support 3G network including both the Xoom and the iPad 2. However, Xoom seems to have added a 4G network which makes it win the race. Either way, these two gadgets, aside from having been manufactured by two powerful companies, have what it takes to impress the market. Each having their great assets, Iâ€™m sure they will have their own market share. Now we know why these two are highly anticipated tablets. What is everyone else take on these two tablets? We would love to hear some opinion if you are using any of these two. Here, the iPad 2 gets the win. Uses LED Display. Images on its display looked evenly and accurately saturated and balanced. The Xoom has a 1280-by-800-pixel display, but its text rendering was inconsistent, with several fonts showing unexpected choppiness. More worrisomely, colors appeared to be off the Xoom’s duller colors, as compared with the Tab’s oversaturated colors. The answer depends, in part, on your shopping habits and on how you use your tablet. Android 3.0 on the Xoom is a terrific multimedia combination: HD movies look great in the widescreen aspect ratio, you get Flash support for online video, and Google’s redesigned music player is very appealing. On the other hand, Android 3.0 lacks a dedicated video player, so your videos get meshed into the Image Gallery. Apple’s iPad 2 requires iTunes syncing–a drawback considering the albatross that iTunes has become on the whole. But it’s fairly good for organizing and keeping track of your media, and if the files are in a supported format, you can add your own videos to the iTunes library. If you have an iPod or iPhone, and you shop at iTunes, the iPad is a no-brainer for its seamless integration with the iTunes Store (shown here). At the moment, Google lacks anything comparable, though I can imagine Google deciding to sell music (Google Music is already a reoccurring rumor) and videos through its Market. The clear advantage in Web browsing goes to the Xoom. The Xoom’s tabbed interface makes navigating through a multitude of Web pages remarkably easy. I also liked the visual bookmarks and appreciated the support for Adobe Flash Player 10.2. The iPad 2 is stuck in the dark ages of Web browsing. Both tablets permit you to access only one page at a time, so you must exit one page before you browse to another. In addition, the iPAD 2 limits the number of windows you can have open at a time. Apple’s iPad 2 enjoys the clear advantage here. Today, Apple’s iOS has a bigger selection and a bigger commitment from content makers than Android does, though more Android 3.0 games should become available as the year progresses. Millions of people use iPads already, and third-party benchmarks indicate that the new A5 chip has more graphics muscle than Nvidia’s Tegra 2, which is found in the Xoom and in all announced Honeycomb tablets to date. The Xoom has considerable potential for games, but first more Honeycomb-optimized apps must be developed first. Only then will it be possible to gauge how synthetic benchmark readings of the iPad’s graphics capabilities stack up in the real world to its rivals’. All of the major booksellers have apps available across mobile operating systems–except for Apple’s iBooks, which (as you’d expect) is available only on iOS. Both offer flexibility in your choice of reading platform and shopping site; but in my opinion, none of these tablets is especially good for reading. Of the two true tablets, Apple’s iPad 2 comes in first. Its larger screen makes it a good choice for viewing digital magazines or magazine apps, and it’s good for viewing larger-print text. In addition, you have plenty of choice with regard to reading apps and bookstores, including Apple’s iBooks and competitors such as Amazon and Barnes & Noble (that could change, however, once Apple begins enforcing its crackdown on in-app purchase options). Whichever model you choose, I recommend playing with the font choices in your chosen e-reader app, as some fonts render more smoothly than others. Ditto for the Xoom: Font rendering could be an issue, as some text fonts look sharper than others. Today, the best reading app available for Xoom is Google Books, but its display options are limited (only three font sizes?) and using it entails committing to buying your books through Google’s Market bookstore. Still, you do get a few font choices, and some of them render better than others. Honeycomb-optimized versions of Amazon’s Kindle app and B&N’s Nook app should arrive soon.